What is it about the companionship of a dog that is so rewarding? There is of course the loyalty between the animal and the owner and something soft to pet whenever the need. But there is also the unconditional love between the two. Chile and Northern Argentina have an abundance of stray dogs. On a daily basis all types of dogs roam the street, sleeping in plazas, playing in parks and just being happy dogs. The amazing part is that all of these dogs seem really healthy with shiny fur, seemingly well fed and the most sweet demeanors. Sometimes they follow you. The join you in your walk, they frolic along side of you with an occasional nudge or lick. Then after just minutes or hours the relationship is severed. This is the story of some of our newest and lost friends. I write this sitting on a bus after leaving one of the kindest dogs we have spent time with. Carmen and I stayed the last few nights in Tafí de Valle; it’s a tiny town, but we were able to spend a long day hiking. An hour into our trek and we were in the wilderness with infinite lengths of rolling hills and a scattering of wild horses. Suddenly this dog runs up from behind us barking, but not at us, instead he was herding the horses away from us. He stayed with us the entire day nudging us with his head, rolling into us as we took a break to eat cheese. He was so content to just have someone to walk with. We hiked for hours, scrambling down rocky mountains then jumping rocks in the creek. When we arrived to the town he joined some of his dog friends and although saddened, I was happy it was a clean break-up. Then at the bus station the following morning this black shaggy dog with brown paws and eyebrows prances across the field. The dog was absolutely elated to find us, thrilled to see us after probably searching the entire night. He tried to say good morning to everyone, but instead we watched a woman push him away with her boot disgusted that this thing would try to get close to her. He liked it, willing to accept all the petting he could get. It must be easier for some people to act aggressive in these situations; they harden themselves against the world, locking down all emotions. I’m different. My new friend plopped between my legs and immediately fell asleep. I must have been the only safe thing he has had in weeks. Then, it was time for me to board the bus. My friend looks longingly at me, Carmen gives him a last pat on the head and we leave, his heart broken and a little of mine too. I also remember the tall skinny one that was white with brown patches in Santiago. He walked with Bobby, Stephanie, Carmen and me for a half hour. He was very skilled at crossing the street. Can you imagine dogs walking only on sidewalks, stopping at red lights and only crossing after looking both ways and a “walk” signal? The dogs in Santiago can do this! This dog was particularly sweet, with so much joy just to be walking with some people. An occasional nip of my fingers or throwing his body against my kneecaps was his way of saying that he liked my company. Suddenly we saw our local bus, we ran for it, paid our fare and our friend pressed his face against the glass, and barked “Why can’t I come?” He ran alongside of us weaving around people, leaping in and out of the street, then, when almost being hit by a car, he gave up. 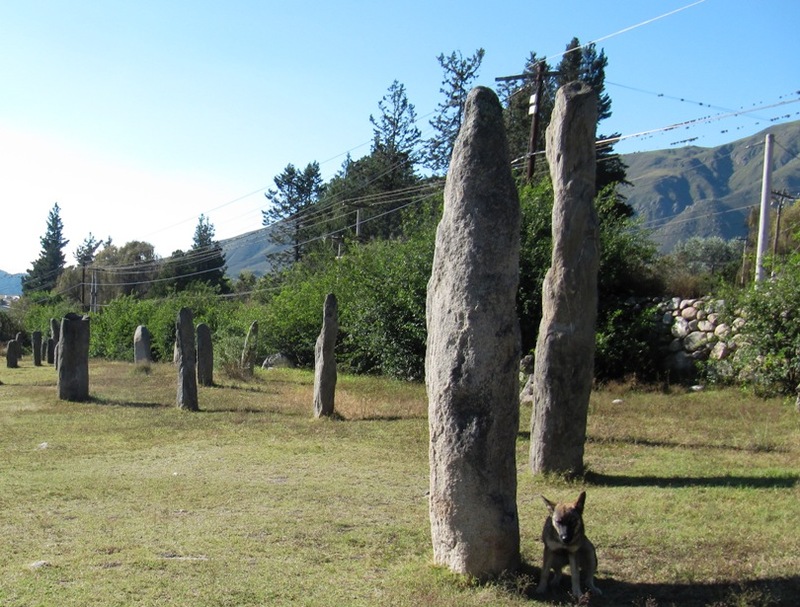 Then there was the little female that followed us into the archeological site in Mollar. I gave her some rind from our cheese and she looked at me with the excitement of a child´s Christmas. 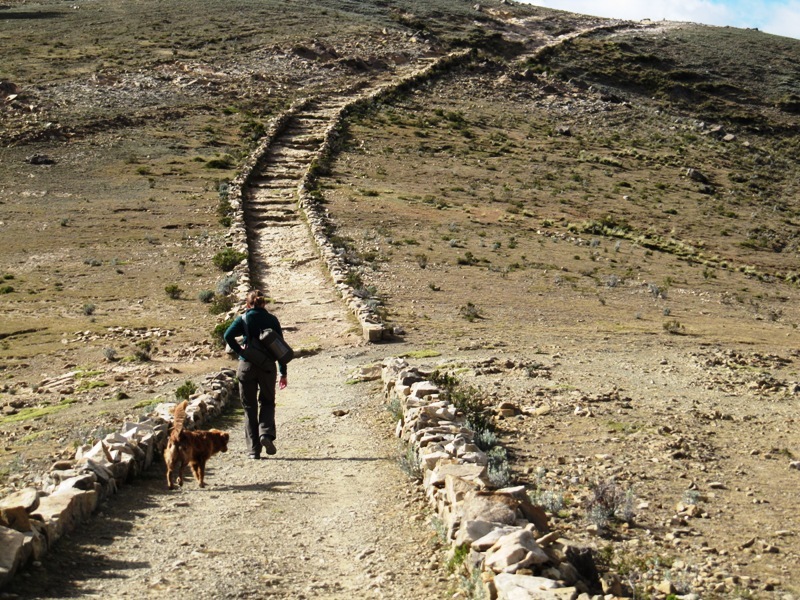 Another dog followed for five hours on the sacred Incan ridgeline of Isla del Sol in Bolivia. I do not want to forget the famous Pancho of Lujan de Cuyo, the half dachshund, half pug and a half something else. He waddled his way through the winery of Pulmony with us. 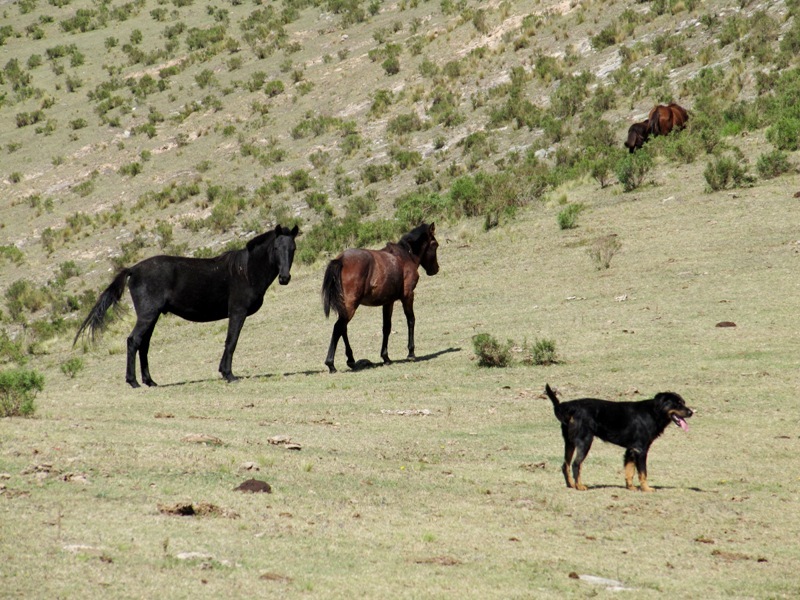 And there was the skittish black shepherd in Mendoza that found us three days in a row. He had some sort of death wish because he liked to bite front bumpers. I doubt he is still alive. There was also the mother and pup that fought for our affection. The most adorable puppy trotted around with us at the hot springs, so clumsy that I thought he was going to fall into the hot water. Numerous friends, numerous relationships have ended, but are not forgotten. Although it is sad that there are so many strays it has been nice to make these new friends. Throughout South America we have had an obvious language barrier, but for some reason a scratch behind the ear does not work for most Brazilians. To a dog I give a little recognition and they give loyal unconditional love. They are indiscriminate with their friendship and similarly I can only hope to be that type of friend. To be a companion that is compassionate, without judgment and loyal to the end. **Two weeks after writing this, Carmen and I were stopped in our tracks by a not so friendly enormous rottweiler. We had to load our fists full of rocks and a very spiny bush. Luckily we were able to sidestep him on another road. 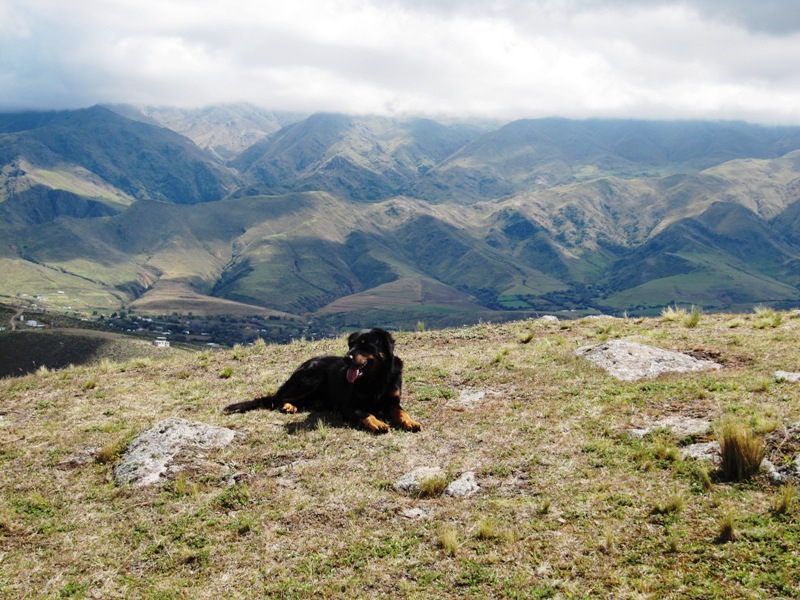 On another occasion a pack of three dogs went for me in Bolivia and I was able to stave them off with a few rocks. There is a distict difference between the homeless loving strays and the fiercesome dogs left to roam away from their homes.